When redoing our home, we can always find a lot of old furniture lying around in our basement, at the corner of our garage, in our backyard or inside the house. Before throwing them away, please take some time to read over this blog. You will be happy to come across this post and benefit a lot from it. You will find, just with a bit of creativity and DIY magic, you can transform old furniture into some brand new and practical furniture pieces for your home or outdoor space. From repurposing old ladder into bathroom towel rack, to turning old drawers into kids bookshelves, these furniture makeovers are easy and affordable. 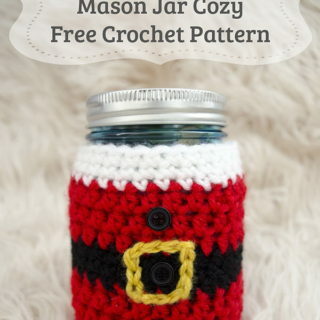 Some are perfect for your home decoration. 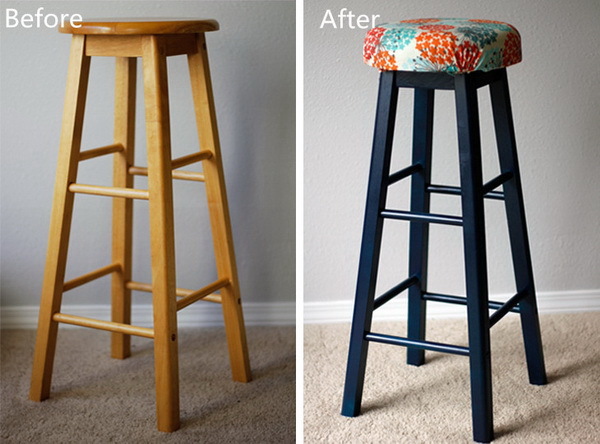 Be creative to extend the life of older furniture and give your house a new look and feel. The China cabinet from the thrift store looks so dated with the natural wood tones. 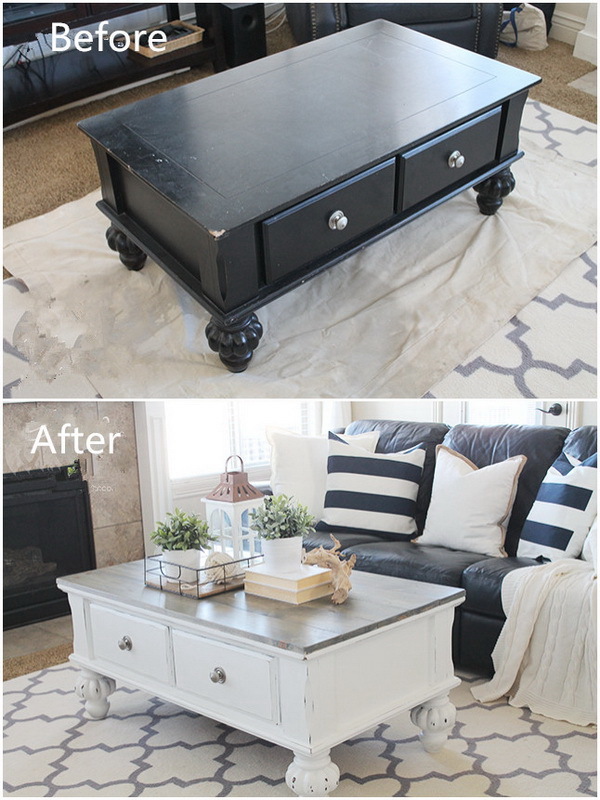 Turn it into such a great piece of furniture just with some gray blue chalk paint. Tutorial: Thrift Diving. Turn the old drawers into a fresh new and functional bookself for your kids! What you need are just some pieces of Ikea spice racks and spray paints. Tutorial: On The Banks of Squaw Creek. 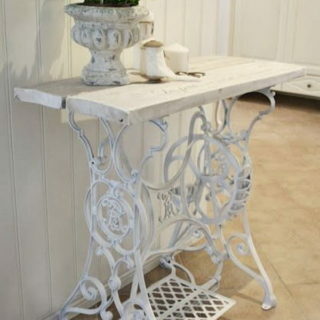 Try to make a new entryway bench in several steps and brighten up your space with such a great furniture piece! What you need are some paint, new knobs and some bright fabric! Tutorial: Old House To New Home. 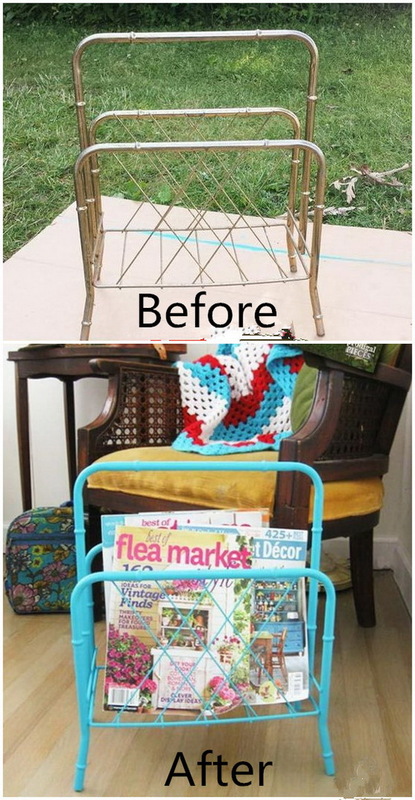 Have an old baby’s crib in your garage and do not know what to do with it? 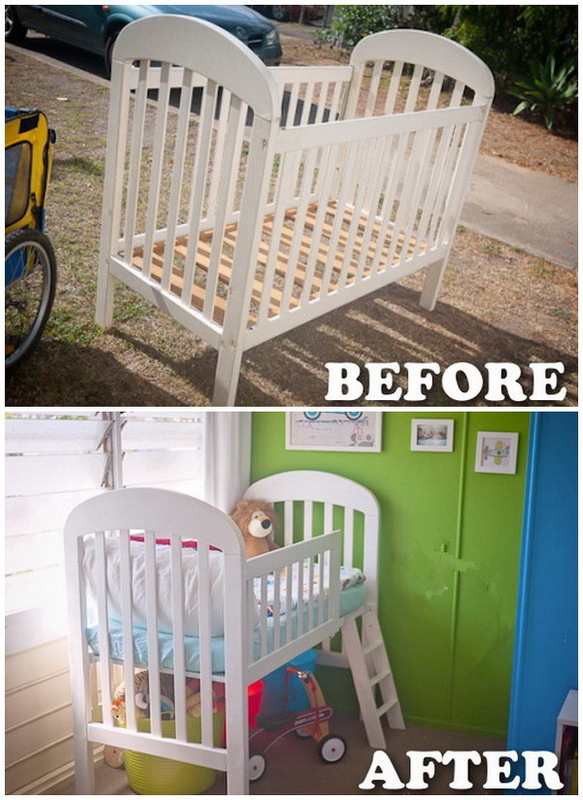 Be creative and transform them into such a awesome and practical kids’ bench! 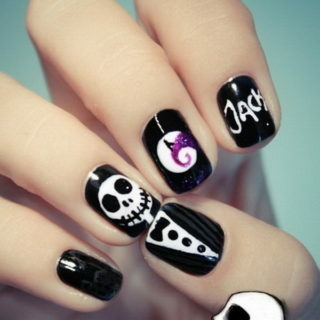 Tutorial: Grillo-Designs. Love how this modern painted huch turns out! 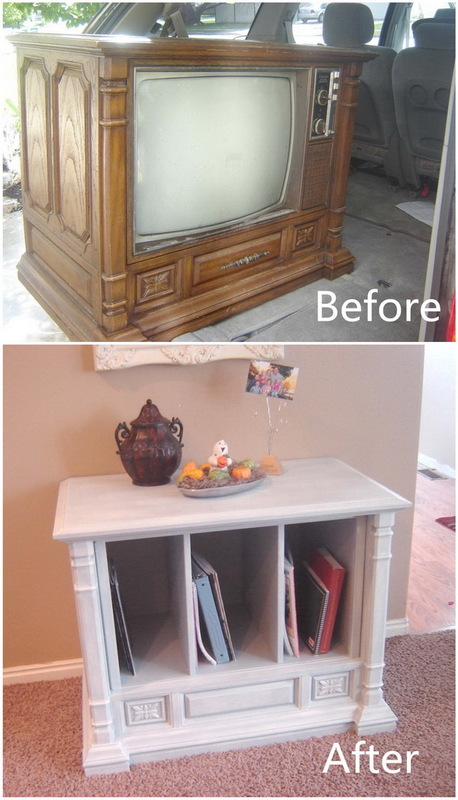 The color Urban Bronze and light gray give this old furniture a finished retro look. The strips on the drawers and the new hardward give more details to this awesome furniture piece. Tutorial: Fun Cycled. Give this old piece dresser an antique French look with the blue spray paints and new knobs and handles. Tutorial: Blesser House. There are many ways to repurpose the old and dated dresser hutch. Here is an awesome idea to transfer it into a stylish sofa table for your living room or an entry way shelf for storage or display. Tutorial: Hannah Bunker. 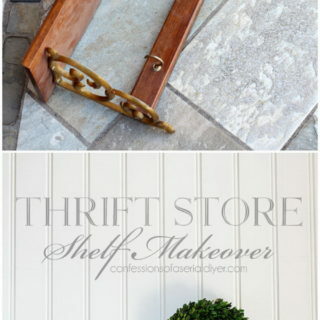 Transform the thrift store shelf or an old shelf in your home for a clear shabby chic look! 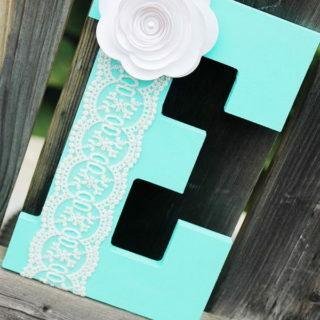 It turns out so stylish and will be a wonderful addition to your room. Tutorial: Confessions of a Serial DIYer. From drab to fab! Do not so quick to throw out all pieces of your old bed when you get a new one, like the headboard. You can make a brand new bench out of it for your home or outerspace. Tutorial: Sweet Pickins Furniture. Repurpose the unused ladder into a practical and stylish rack for the bathroom towel storage. Tutorial: Funky Junk Interiors. Tutorial: Confessions of a Serial DIYer.